The NYC Printable Map Guide Book Package is perfect if you are tired of printing your own custom guide book from the dozens of internet sites about NYC. Have you been scouring the internet trying to find NYC street maps, directions, attraction locations and prices and are tired of all the printouts? The NYC Printable Map Guide Book Package was created to save YOU time, money and the hassles of vacation planning. Download over 100 pages of NYC maps, information and recommendations in less than 5 minutes! New York City Travel Guide bonus – What to Know BEFORE You Go. 35 pages of Vacation Planning tips to help you plan your trip so you make the absolute MOST of your time and money in NYC. An organized, easy to follow, color coded guide to NYC. The Printable NYC Guide includes detailed maps of every neighborhood, weekly chart of Free Museum Days and Times and free weekly neighborhood tours, Best of NYC Categories and lists by ALL native New Yorkers and much more. Print as many copies as you like, share them with friends and family and ONLY take the pages you need while you’re travelling. The NYC Printable Map Guide Package includes a 13 page downloadable Bonus Guide. Having gone through all the top New York City sites, I compiled many of the other free, downloadable maps and put them in one file. These included local neighborhood maps with stores and shops block by block put together by our local NYC neighborhood associations. Our bonus FREE New York City Travel Guide is your NYC PRE VACATION Guide, sort of like, “New York City 101.” This book is an overview of NYC to help you PLAN your trip so you make the absolute MOST of your time and money here. Think of this book as the guide to answer all the most commonly asked questions and avoid the most common NYC Vacation and Trip Planning mistakes. There is only ONE WAY to get the bonus FREE New York City Travel Guide. First hand, practical, organized New York City information you can download and print with one click is hard to find, so I took the best of this site, added maps, directions and details, and created a Print Guide to New York City. Detailed maps of every NYC neighborhood, along with top Things to Do and See, my personally recommended restaurants by neighborhood, Shopping, Subways and a few key hotels. If there is a NYC Insider Tip – it’s in there. Best of NYC Categories and lists by ALL native New Yorkers! I’ve read what other tourists say on some other websites, and I’m telling you, they missed out on what we REALLY do and eat here! Even I learned A TON of new information just by compiling the guide. 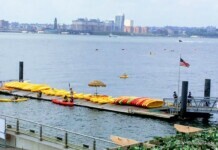 Best of NYC lists include: Museums, Pizza, Parks, Kid’s Activities, Kids Restaurants, Discount Shopping, Romantic Places, Farmer’s Markets and much more! *Note: Some of the maps are very graphic intensive and may be large files. My friend and I just got back from our first trip to NYC. Your guide was GREAT!! We used it everyday. I particularly loved how there were suggestions for each area/neighborhood! That was very useful! The NYC Insider Print Guide comes with a 7-day full money back guarantee! If you are not 100% completely satisfied with your purchase, just email us your original Paypal receipt email and we will refund your purchase via Paypal within 5 business days (usually sooner). All we ask is for honest feedback as to why the guide did not meet your expectations. Pay directly with a credit card or use your PayPal Account. PayPal uses the latest in data encryption and anti-fraud technology to keep your information secure, reducing the risk of online fraud. Every day, 169 million people use PayPal in 190 countries and with 21 different currencies. A PayPal Verified seller has provided additional evidence of their identity to PayPal by passing key security checks and completing the PayPal Verification process. When you make a purchase through NYC Insider Guide, your personal information, including credit card number is encrypted, using the same protocols used by sites like Amazon.com and EBay. I can’t wait to visit NYC later this month. I LOVE the color coded maps, price guides, dining resources, etc.! It is so much easier to use than any guide I’ve used before. Thanks again! Where is a good printable map of New York City? How far is the Statue of Liberty from the Empire State Building? 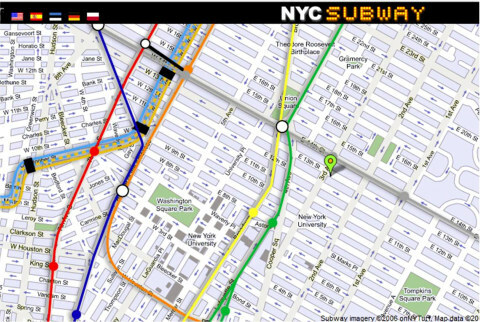 Where can I print a subway map and how do I use the subway? What is the best way to plan my 2 (or 3, 5 or 10) day vacation so I make the most of my time and money? 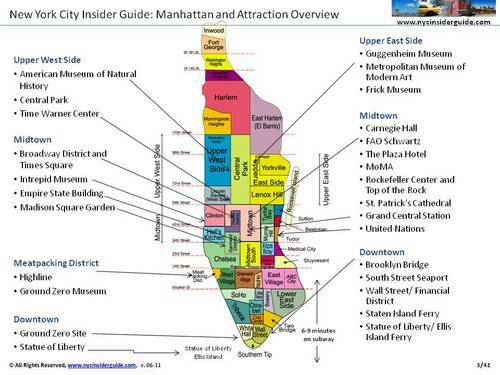 The NYC Insider Guide is here to help. Even as a lifelong New Yorker, some of this information was hard for me to find. I looked at a few tourist guides, dozens of websites, made a few calls to Museums and other attractions and used all the great free maps I have just from being in NYC all my life. Then I ate a LOT of pizza, because you can only write about great food for so long before you MUST eat some…yummmmmmm! Excellent guide! 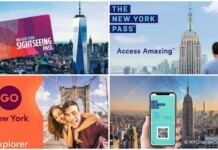 I am traveling for the first time to New York City in September and this guide will help me not miss out all the great attractions NYC has to offer. Why a Downloadable Guide or E-Book? Always up to date. If I go to new, great restaurant, it will be in the EBook in a week. The information in hard copy travel guide books is usually at least one year old, often older. 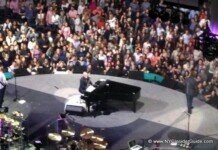 In New York City – that’s a lifetime! Get free updates for a year. Guide Book updates are tracked here. Just email anytime within a year of purchase and I’ll send you an updated Guide. So even if your trip is 6 months away, you can start planning now, and get an updated guide right before your trip. It is near impossible to get lost in NYC using this guide. You will always know where you are and how to get somewhere else. No need to carry a heavy book while on vacation. You print it on your own 8.5″ x 11″ paper and when you’re here, just take the pages you need for the day. You can write on them, fold them, stick them in your back pocket. Each page in the EBook is the equivalent of 2-4 pages in a hard copy travel guide. Just finished up at the Empire State Building and want to grab the best slice of Pizza in the neighborhood? 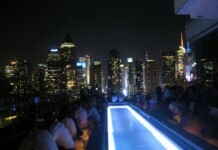 Or you loved the view so much, you want to grab a cocktail with a skyline view? We got you covered. The guide covers only Manhattan. It does not include Harlem, Brooklyn, Staten Island, Queens or the Bronx. Phone numbers, hours of operation (opening/closing times of attractions), cash/credit card acceptance, except where noted. Exact restaurant pricing. Exceptionally expensive (over $50/pp) or cheap (less than $10 or free) meals are noted, but the rest are somewhere in between. I do tell you what NY-ers think are the best restaurants. I put in some NY Style addresses, like 53rd and 9th Ave. If you’re there and can’t find what you’re looking for, ask anyone – New Yorkers LOVE to answer questions. More people will be able to help you with NY style addresses than if you said, “1675 Broadway.” Hardly anyone knows addresses in NYC (not even taxi drivers). History, Architecture, Photos. The guide is mostly “just the facts.” The Empire State Building tour tells you how and when it was built. 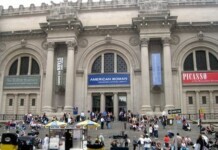 You can also get a supplemental guide, or wait until you are in NYC, where there are several hundred guide choices in the bookstores, as well as dozens of free tourist guides with this information. No where is it organized and presented to you in this easy-to-follow and print format, with clearly color-coded printable maps and Insider info on where to go for the best and best-value food, shopping, activities, etc. NYC’s “best of the best” is not advertised..it is spread by word of mouth. Do I still need the NYC Insider Guide website? Yes. 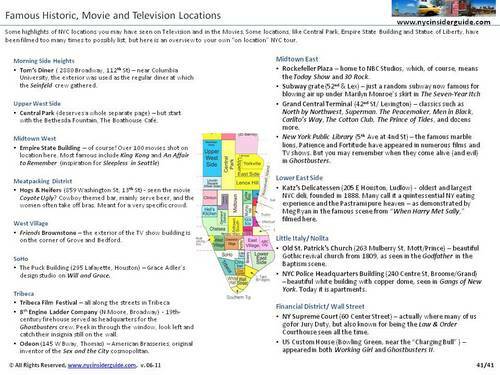 The site still has a lot of information not in the NYC Printable Map Guide Book, such as online planning steps in our NYC Vacation Tips, Cool Events by Month, Broadway Ticket and Discount info, photographs and details on Sightseeing Passes. However, other than time-sensitive information, the book contains a lot of what you need to plan, and most everything you need once you’re here. The only additional thing to print might be the Monthly Events page for the time you are here. Very easy to read and very useful information. Easy to print out and handy to take with you. Love the way it is divided into areas with maps for reference Keep up the good work. How do I get the NYC Insider Print Guide? Simple, pay $19.99 and download it immediately to your computer. Pay securely through Paypal, using either your Paypal account or credit card. Right after you click “Pay Now,” the screen will say “You are now being redirected to FilmProposals-NYC Insider Guide” Wait the 5 seconds until you are redirected. If for any reason, you are not redirected, don’t worry. Within a few minutes, you will receive 2 emails from me. One will have your invoice number and receipt. The other will contain a link to download the Guide, good for 5 days and 5 attempts. SAVE the email with the link and my email, just for buyers, should you want an updated Guide within a year of purchase. Guide Book updates are tracked here. If you have any trouble after a few hours, please Contact Me. Requirements: The file is in Adobe PDF, over 3.0 MB in size and should be printed in high quality color, as the detailed maps and keys will show best this way. There are two ways to get the FREE 10-page Mini Guide. You can SHARE this page and get immediate access or you can sign up for our newsletter below. Subscribe to the free newsletter, Manhattan Weekly, and get the free 10-page Mini Guide. You want to SEE the NYC Printable Map Guide Book, right? No worries, I would, too. This is the Internet, after all. 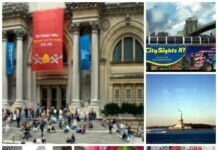 Right away, you can download a few sample pages, best when used with our NYC Perfect Vacation Planning guide. The payment processor has not yet informed us about your payment. Your order will be processed as soon as they inform us about the payment. If required, any information related to this order will be emailed to you. If you do not see the email in your inbox, please check your spam filter or bulk email folder. A) Don’t worry. Within a few minutes, you will receive 2 emails from me. One will have your invoice number and receipt. The other will contain a link to download the NYC Printable Map Guide Book, good for 5 days and 5 attempts.